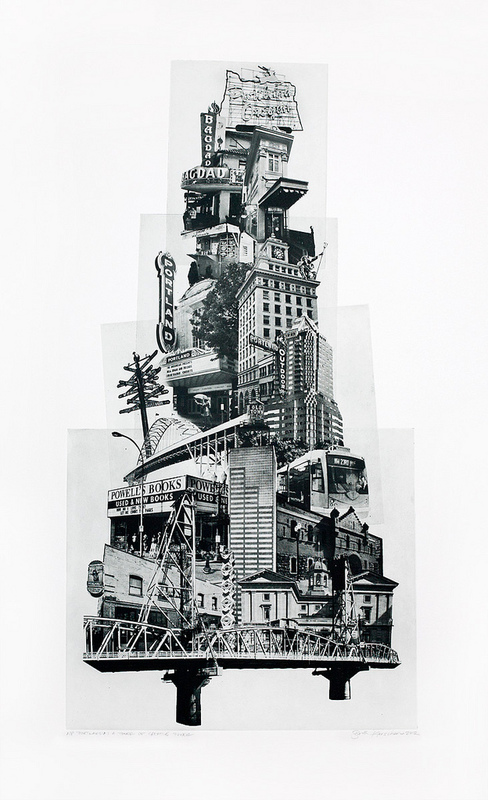 Beth Kerschen is a multi-disciplinary artist using photo-illustration and printmaking to reflect a city’s culture via the urban landscape. For the past seven years, Portland, Oregon has been her focus. In her current installation at PDX, Portland: East Meets West, she has captured Portland as it exists at the present moment: a city bursting with creativity. Portland: East Meets West celebrates the cuisine, music, cycling, artists, technology, cinema, vintage, DIY, alternative movements, outdoors, history, architecture, bridges, transportation, and even rose gardens of our fair city. By memorializing these everyday scenes, she hopes to inspire others to celebrate our city’s present. With enough awareness and appreciation of what makes Portland unique, we can sustain the best of our culture as Portland’s landscape rapidly changes into a world-class city. 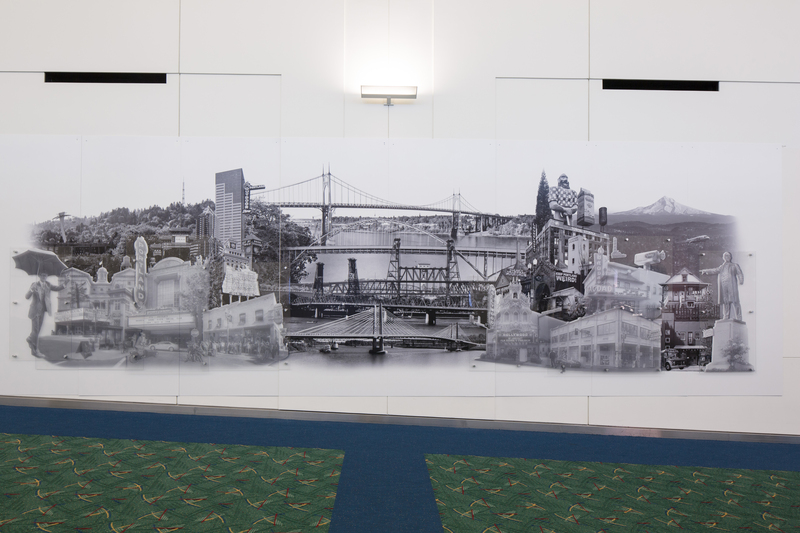 Kerschen’s installation at PDX incorporates many Portland landmarks. On the left side (West side), note the pile of bikes between Schnitzer Hall and Voodoo Doughnuts. That’s the original Zoo Bomb Bike Pile. If you haven’t heard of Zoo Bomb, it’s a unique weekly event where adults (mostly) take kid sized bikes to the Zoo, high up in the Washington Park hills, and then ride (“bomb”) downhill to downtown. Afterward, they pile and lock up the bikes until the following week. There’s a new Zoo Bomb Bike Pile (and a statue, approved under Mayor Sam Adams) on SW 13th and Burnside but Kerschen wanted to pay homage to the original pile, organically formed around an old stop sign. Sign up for blog updates or follow PDX on twitter @flypdx to get more interesting facts about Beth Kerschen’s installation on Concourse B. Hear Beth talk about this installation on KBOO, Portland Community Radio’s Art Focus Program!